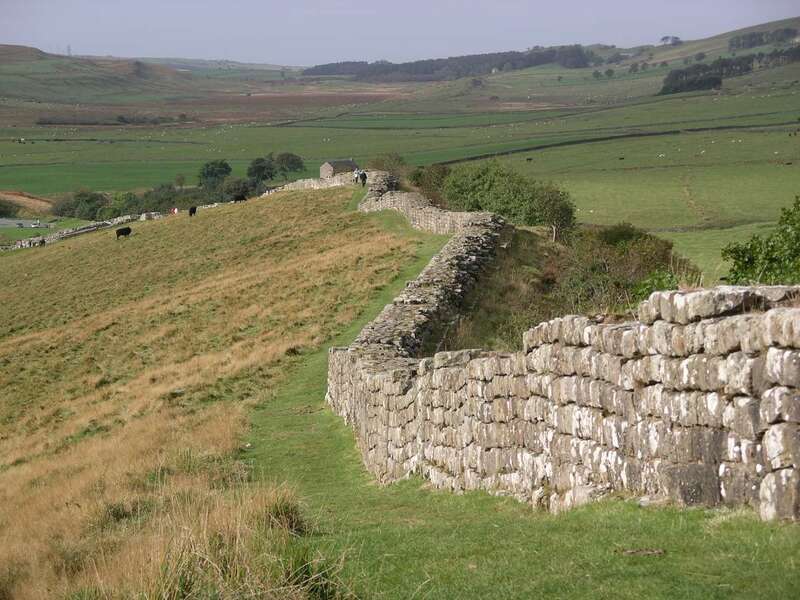 “Hadrian's Wall was 80 Roman miles or 117.5 km (73.0 mi) long; its width and height were dependent on the construction materials that were available nearby. East of the River Irthing, the wall was made from squared stone and measured 3 metres (9.8 feet) wide and 5 to 6 metres (16 to 20 feet) high, while west of the river the wall was made from turf and measured 6 metres (20 feet) wide and 3.5 metres (11 feet) high. The initial plan called for a ditch and wall with 80 small gated milecastle fortlets, one placed every Roman mile, holding a few dozen troops each, and pairs of evenly spaced intermediate turrets used for observation and signalling. However, very few milecastles are actually situated at exact Roman mile divisions; they can be up to 200 yards east or west because of landscape features or to improve signalling to the Stanegate forts to the south.” The milecastles and turrets were of three different designs, depending on which Roman legion built them – inscriptions of the Second, Sixth, and Twentieth Legions, show that all were involved in the construction. All were about 493 metres (539 yards) apart and measured 14.02 square metres (150.91 square feet) internally. ("Hadrian's Wall." Wikipedia. Wikimedia Foundation, 11 Oct. 2014. Web. 09 Nov. 2014.) Here is a map of the wall running across England (Contours). “Hadrian's Wall makes use of locally-available materials. Running for forty-five miles from the east, the Wall was built of stone. The stone wall had two outer faces of dressed stone, containing a centre of rubble. The remaining thirty-one miles of the Wall in the west was built of turf. The turf wall, constructed from turf blocks, was built either from the prepared ground or upon a bed of cobbles. Rubble and mortar were used to fill the centre of the stone walls. Both stone and turf portions of Hadrian's Wall are pictured below. The Wall was built from locally-quarried stone; Roman stone-masons have left inscriptions in the stones which describe the location of these quarries.” ("Hadrian's Wall Gallery." BBC News. BBC, n.d. Web. 10 Nov. 2014). The stone walls themselves were well-built, with a rubble core between facings of dressed stone set in lime mortar.Construction was divided into lengths of about 5 miles (8.0 km). One group of each legion would excavate the foundations and build the milecastles and turrets and then other cohorts would follow with the wall construction.